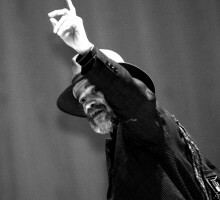 John Agard - Poetry Live! John Agard was born in Georgetown, Guyana. His love of language began in school where his favourite subjects were English, French and Latin. A Roman Catholic altar boy, he was deeply affected by the call-and-response style of the Latin mass as much as by the verbal wit of calypso and the poetic cricket commentary of legendary commentator, John Arlott. After a spell teaching and working at the Georgeotown Library, he worked for the Guyana Sunday Chronicle as sub-editor feature writer. He moved to England in 1977 and became a touring speaker for the Commonwealth Institute, visiting hundreds of schools throughout the UK. He has been writer-in-residence at the South Bank Centre, London, the BBC and the National Maritime museum. His awards include the Casa de las Americas Poetry Prize and the Paul Hamlyn Award. Agard has published many collections for children and adults and often writes sequences and books constructed around a central theme as in From The Devil’s Pulpit (1997) which looks at life from the Devil’s perspective and Clever Backbone (2009), sixty sonnets that take a quirky look at evolution. His selected poems, Alternative Anthem, was also published in 2009. His children’s collections include We Animals Would Like A Word With You; Einstein, The Girl Who Hated Maths; Hello H2O; and The Young Inferno (a teenage spin on Dante’s classic) which received the CLPE Poetry award (all illustrated by the Japanese artist Satoshi Kitamura.) Agard’s latest publication is Goldilocks On CCTV, a collection inspired by fairy tales and also illustrated by Kitamura. Agard’s children’s books are as philosophical as his adult books but entirely accessible to young readers. He lives in Sussex with his wife, the poet Grace Nichols, with whom he co-edited No Hickory No Dickory No Dock (1991) a collection of Caribbean-flavoured nursery rhymes; A Caribbean Dozen; Under The Moon And Over The Sea which was also awarded the CLPE Poetry Award. Their latest anthology for children is Pumpkin Grumpkin, a collection of nonsense poems from around the world. Agard also writes verse plays, his latest being Calibania, a thought-provoking re-visiting of Shakespeare’s The Tempest, as well as performs with Grace Nichols in a joint rendition of poetry duets such as Sugar Cane’s Saga and Sunris and Man To Pan, which interweaves Sunris (a Nichols character who journeys through Carnival) with Agard’s Man To Pan, a celebration of the steel pan, the pulse of Carnival.